It doesn't matter if it's a cheesecake, cupcake or pudding, if it can be frosted with a white icing you can make it into a United States Flag for your 4th of July Independence Day celebration. You can either use some blueberries, raspberries, and whipped cream topping or use colored cake decorating frosting and you are on your way to create your own flag dessert. For a delightfully light dessert using blueberries and raspberries follow these no-bake instructions, perfect for a hot summer day, to create your own flag dessert. Cake decorators should review our step-by-step cake decorating instructions that show, how to decorate a Fourth of July Flag cake using colored buttercream. Not only can you make a flag design out of a cake, cupcakes work too! Create your own cupcake flag! Be creative.... have fun... and decorate your cupcakes with sprinkles, glitter and picks. 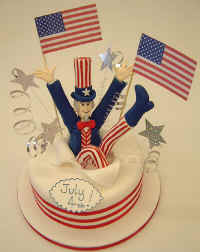 Uncle Sam bursts out of the cake! Check out Uncle Sam!! Is he having fun or what? Follow our step-by-step instructions that show how to make a Uncle Sam 4th of July Celebrations Cake! Follow our step-by-step instructions that explain how to create delicious flavored hard candy and suckers. Do you remember why the United States Flag has 13 stripes and how many stars there are? Q: What are the colors of the United States Flag? Q: What do the colors represent? Q: How many stripes are there on the United States Flag? Q: How many stars are there on the flag? Q: What is the 4th of July?